13900LF-SS is rated 2.8 out of 5 by 18. 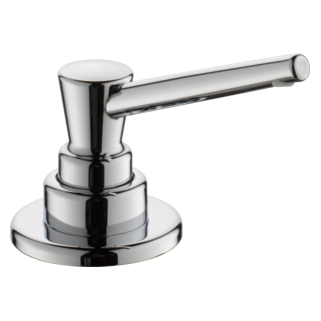 Rated 3 out of 5 by Cacw from The handle is too short and stubby.it's so short, when you wash your hands, everything runs down the handle onto the deck of the faucet & gunks it up The handle is too short and stubby. It's so short, when you wash your hands, everything runs down the handle onto the deck of the faucet & gunks it up. My previous Delta kitchen faucet had a longer handle-as a result, stuff on your hands dropped into the sink below it. At most, I would wipe off the handle. Now water, soap, whatever is on your hands when you lift the handle runs down the handle, onto the deck, and behind the faucet to the seam where the sink is caulked to the countertop.Always wiping that area up. Also, my old longer handle could be lifted up by my elbow, arm, etc to turn the water on. hence avoiding soiling/dripping whatever. Not so easy with this one. I wish I'd opened the box before I bought it. It was the only model the store had for my type sink, and the plumber was coming, so I just bought it. It's my fault for not checking, but I didn't expect a kitchen faucet handle to be so small, and didn't know it'd be a problem until after it was installed and I began using it. 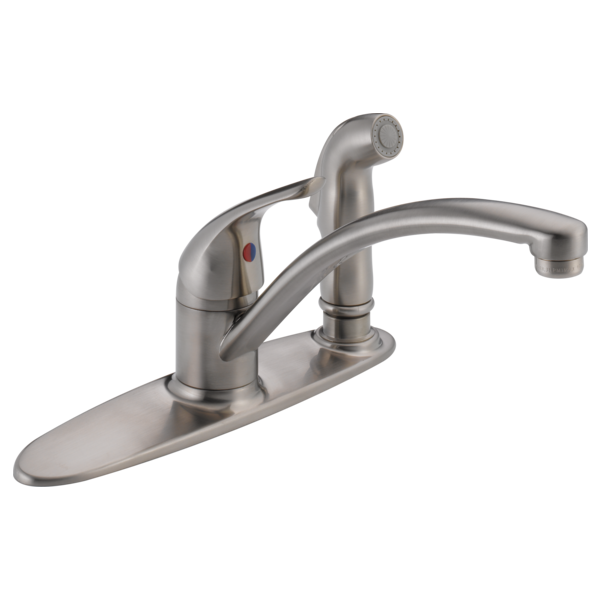 Rated 1 out of 5 by KRB52 from Disappointing design and performance Like others, we have used Delta for years and felt safe in replacing our kitchen faucet with the Delta model 13900LF. Shortly after installation we, too, began hearing the "clunk" noise when the faucet was opened and quickly realized this was an indication the sprayer head was leaking. If we were careful to hold our mouth just right and place the head back in the holder just right, the faucet would usually operate without the sprayer leaking. Eventually, we had to learn to live with the faucet by just not using the sprayer - sacrificing one of unit's primary features. Recently I thought I would try the sprayer again. Big mistake! It began leaking so severely there was no stopping it. Thinking this should be a simple matter to replace the sprayer head, I unscrewed the head from the hose end connection to remove the spray head from the hose. That's when I discovered the sprayer base was factory assembled as an integral part of the hose and could not be removed from the hose. So, I next removed the whole sprayer hose assembly from the faucet and headed to the hardware store. That's when I discovered the "quick connect" connection to the faucet unit is a proprietary design for Delta so none of the "universal" replacement hose assemblies would work because they wouldn't connect to the faucet and even the Delta replacement hose the store did have was a different design than this one. It's now obvious that the only replacement fix is going to come from Delta but looking on line, I find the replacement hose assembly is not available in the finish of our faucet. That's okay as I don't want to pay $65 for a replacement that is likely still the same flawed design as the original. Fortunately, plumbing fittings are available that will allow me to splice the sprayer hose and attach a "universal" hose assembly - one that also allows the head to be replaced so I can purchase and install a head similar to the original - all for much less that $65. Haven't written Delta off yet but will definitely consider other options in the future. 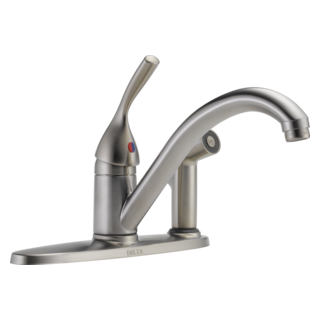 Rated 3 out of 5 by HappyCamper17 from Makes a 'clunk' noise when turning on either hot or cold water I replaced counter-top, sink and faucet which went OK except the Delta 13900LF-SS faucet makes 'clunk' noise when either hot or cold water is turned on. The installer suggests replacing the faucet which does not make me a happy camper. Rated 2 out of 5 by JWG115 from 13900LF-SS not up to Delta's standards I have used and recommended Delta for over 30 yrs in the modeling business. I have always been very pleased with Delta's quality. However, this 13900LF-SS did not live up to Delta's standards. Sprayer stopped working, shooting water in all directions, could not be repaired. Faucet itself vibrated under water pressure to the extent it loosed the bolts underneath the cabinet. I do not recommend this "sold only at Lowes" item. Rated 5 out of 5 by NavyVet from Great product This product is great. I installed it in my motorhome. The packaging was great and the instructions were simple and easy to read and understand. I have used Delta products in the past and they are always reliable. Plus you can not beat the warranty. 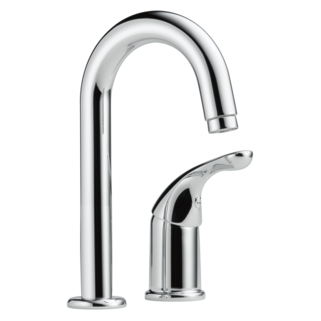 Rated 5 out of 5 by Jim51 from Love that the product does not show water stains Bought this faucet, as it resembles pewter. Our kitchen is done up in black, white, and grey, so it fits in perfectly. My wife is thrilled that the water stains do not show, and is very easy to clean. Have recommended this style and finish to friends, who are remodeling their kitchen. Would definitely buy this item again. Looks great in the kitchen! Rated 5 out of 5 by Ellie from Meetamy needs This faucet was recommended by my plumber and I am very pleased with it. Rated 4 out of 5 by bonniblue from Was the ONLY faucet in my Lowe's that had a sprayer actually on the faucet set This is a good product. However it was the ONLY option I had for what I was looking for. Although it IS a kitchen faucet set, it is a bit light weight for regular kitchen use. Can I get a 14 inch spout for this item? Thank you for your question. We do not manufacture a 14&quot; spout. Can the sprayer be on the left? How do I unsnap the plastic connector locking the sprayer hose to the underside of the faucet. I locked it before inserting the spray support sleeve and need to unlock it. It's probably obvious, but I could use some guidance.